A Democratic Wave in November? … Not So Fast! Democrats continue to warn about the tsunami that will crush the GOP in November’s midterm elections. They believe they will regain control of both the Senate and the House. Generic Congressional polls were looking rather bleak for Republicans as recently as late December, however, the Democratic lead has dwindled in the last month. It is common for the political party that controls the White House to lose seats in both chambers of Congress in midterm elections. There have been two midterm elections when the party controlling the White House actually gained seats in both chambers (1934 and 2002). 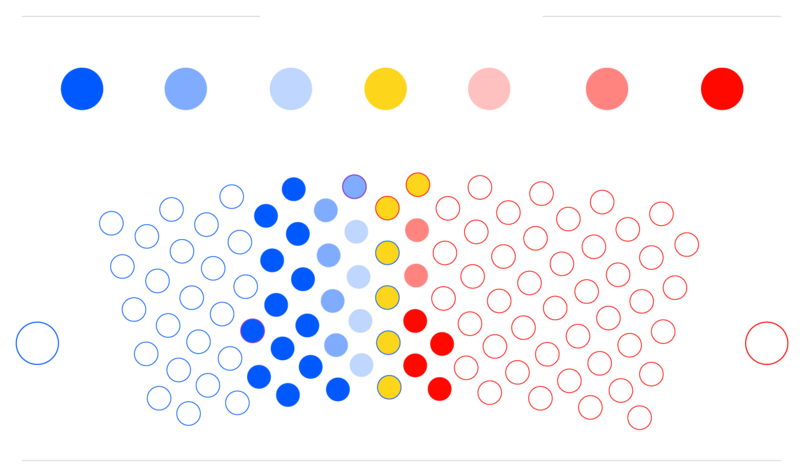 There have been several midterms when the party of the president picked up seats in one or the other, however, it is generally expected that some seats will be lost in both the Senate and the House. Please see CNN’s updated House midterm map below. 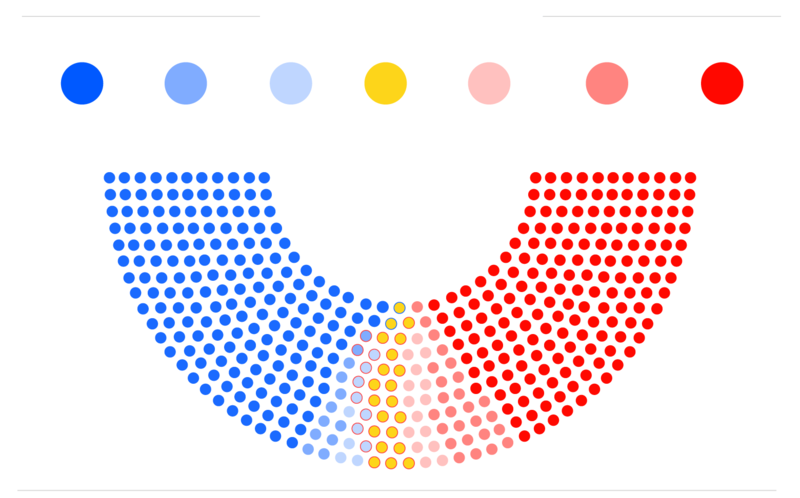 The Solid (179), Likely (7) and Lean (8) Democratic seats plus all 20 seats in the toss-up column add up to 214 seats, which is just shy of the 218 seats required to gain control of the House. This isn’t exactly encouraging for Republicans, but it’s highly unlikely that Democrats will win all of the 20 toss-up seats. Please see CNN’s Senate midterm map below. The balance of power in the Senate is currently 51 Republicans to 49 Democrats. There are 23 Democrats and 43 Republicans not up for election. After deducting those seats that lean one way or the other, we are left with five toss-ups. The Senate could really go one way or the other. Cook House editor David Wasserman suggests that still might underestimate Democrats' ceiling in terms of seat gains this fall. "Most new district-by-district fundraising and polling numbers are downright terrible for Republicans, even in seats previously thought to be safe," writes Wasserman. Cillizza informs us that this shift in sentiment is “fueled by remarkably successful fundraising by dozens of Democratic candidates –"
If that is true, then clearly House Democrats have seen more success in their individual fundraising efforts than the DNC has lately. The Center for Politics consensus estimate of a Democratic majority in the House this November stands at 50-50. Their numbers were slightly better for Republicans than were Cook’s Political Reports, although not materially so. For those who are interested in seeing possible specific paths to a Democratic victory (district by district), please click here. 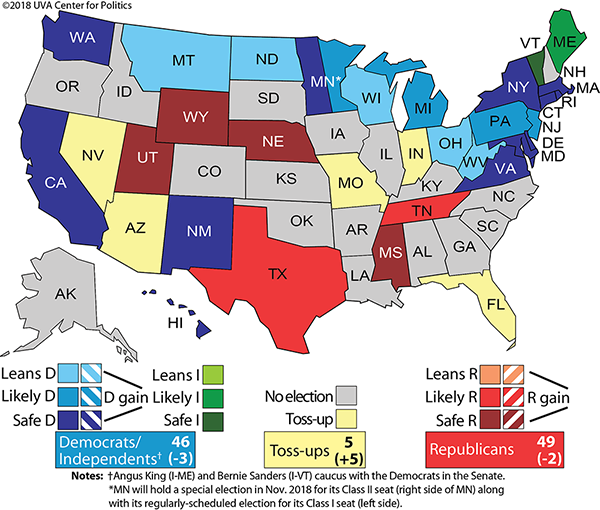 The Center for Politics Senate map is currently showing 46 seats that either lean, are likely or are safely Democratic, five toss-ups and 49 seats in the lean, likely or safe Republican column. Their Senate map is identical to that of the Cook Political Report. It is premature to make any meaningful projections at this point. While rules of thumb favor the Democrats when the sitting President is a Republican, there are so many other factors that will contribute to the outcome. It’s quite possible that the allegations, if proven, made in the Nunes memo and backed up by the Grassley-Graham referral letter will hurt the Democrats. It’s also possible (I doubt it) that Mueller may find some wrongdoing by Trump in his investigation. Democrats want to see a November wave so desperately. Control of the House would make it possible for them to impeach Trump, which is their dream. However, even a slight Democratic majority in the Senate (which is the very best they could hope for) would most likely not allow them to oust Trump, because to do so would require 67 votes. I sincerely hope that Republicans do not lose their majority in either the Senate or the House. As mentioned above, a Democratic House would try and likely succeed in impeaching Trump. It would put an end to the FBI/DOJ investigation, which would be a huge win for Hillary Clinton, Barack Obama, Jim Comey, etc. It would become difficult or impossible for bills introduced by Republicans in either the Senate or the House to reach Trump’s desk. Trump’s agenda would be blocked at every turn. And Nancy Pelosi would take her place again as the Speaker of the House. Ugh! Any one of a thousand events could occur. The point is that nine months is a long time in politics. For Chris Cillizza or any journalist to warn us in February that the November midterm elections are going to be “very, very problematic” for us is simply wishful thinking.